Athens, Ga. – The National Institutes of Health Institute of General Medical Sciences has awarded a five-year extension to the University of Georgia’s Jorge C. Escalante. He will use the funds in the study of vitamin B-12, looking at the biosynthesis and anaerobic metabolism in salmonella. The MERIT, Method to Extend Research in Time, award is an extension of $2.1 million to an initial five-year award announced in 2010. It will support Escalante’s research through 2020. One of the most complex coenzymes in nature, B-12 is an essential human nutrient that is produced by many, but not all, microorganisms. Its impact on human health ranges from the development of the nervous system in infants to the prevention of diseases related to the metabolism of fats. Human pathogens such as salmonella require B-12 to establish intestinal infections. “Our coenzyme B-12 work benefits from important collaborations with structural biologists and spectroscopists. Such collaborations allow us to look in detail, from a biophysical and structural standpoint, into how the proteins involved in the assembly of B-12 work. We are trying to learn how the organisms synthesize this very complex molecule, which is the focus of the grant,” said Escalante, a UGA Foundation Distinguished Professor in Microbiology in the Franklin College of Arts and Sciences. Because Escalante’s laboratory in the department of microbiology focuses on one of the most fundamental questions of biology, the investigations provide extraordinary training opportunities for developing scientists even as they seek solutions to basic questions. Escalante is the sixth MERIT award recipient at UGA since 1992. The NIH MERIT award is given to less than 5 percent of NIH-funded investigators in all disciplines. Because investigators do not apply for a MERIT award, each institute of the NIH submits proposals to their respective councils, where the merits of the candidates are discussed and decisions are made. The MERIT award allows recipients to undertake high-risk research that requires longer timeframes than provided under normal guidelines for research funding awards. 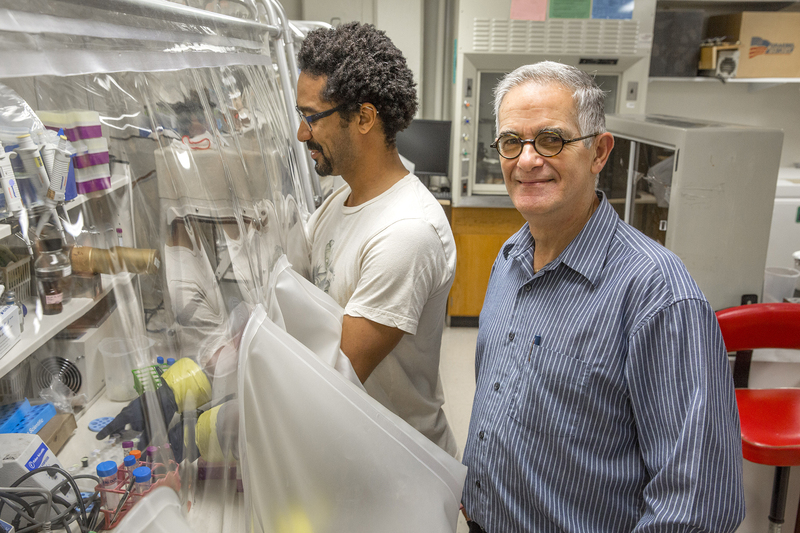 Escalante’s lab uses genetic, molecular biological and biochemical approaches to the analysis of B-12 biosynthesis in microorganisms that occupy diverse niches in nature. This research environment provides an important training ground, both for graduate researchers with laboratory career trajectory and for undergraduate students with diverse professional goals, he said. For the undergraduates working in his lab, providing contextualization for those studying for careers in science is key. “It’s an essential need, in order to gain perspective and see how what they’re learning in the classroom is used to perform research,” he said. He’s found that research into the coenzyme B-12 biosynthesis has great potential for the future of drug delivery and other evolving therapies. “The genes that can encode proteins needed to make B-12 are not present in the human genome, thus the human body does not make those proteins,” Escalante said. “Therefore, B-12 biosynthetic enzymes represent potential therapeutic targets. The development of antimicrobials that block B-12 biosynthesis in human pathogens is attractive because of the predicted absence of side effects on human cell function.